← AMANDA McKENZIE. Labor’s climate policy announcement: not perfect, but a significant advance. Even from a “what’s in it for me” viewpoint, the budget is a failure, because tax cuts would soon be wiped out by higher charges for education, health care and transport. More importantly it does not address structural weaknesses in the Australian economy. The main feature of the budget is a raft of personal income tax cuts, designed in the short-term to reduce taxes for low- and middle-income earners by up to $1080 a year, while longer-term tax cuts are designed to benefit those with higher incomes. The government has been making a lot of noise about “congestion-busting infrastructure” but most projects are ones that have been already been announced, most wouldn’t see any activity until the mid-2020s, and what little new money there is seems to be for small projects in marginal seats. It’s an opportunity missed, because our slowing economy could do with an immediate boost of capital spending rather than political announcements and re-announcements of projects with long timelines. Then there is the promise of a budget surplus – next year perhaps – as if fiscal bookkeeping is a mark of economic competence. The word “surplus” carries a tone of prudent housekeeping, but it has little economic meaning, particularly a surplus that comes from an economic windfall (for example high iron ore prices resulting from an accident in Brazil), from accounting legerdemains (fiddling with the dates of outlays) or from cutting programs providing essential services. As usual, there is no shortage of websites and tables analysing the budget on a “what’s in it for me” basis, showing the effects of tax cuts and other measures with direct fiscal impacts. What they don’t (and cannot) show are the costs of those tax cuts which would be financed by austerity in Commonwealth programs. We may enjoy a dollar in tax cuts, but that dollar comes at a cost that’s more than a dollar when we find we have to spend far more for health care, education, road tolls and transport fares, as services are privatised and as government agencies turn to more or higher user charges, such as “voluntary” school contributions. It’s worth remembering that Commonwealth tax cuts are funded, in part, by tight controls on payments to state governments, the governments that provide our most important day-to-day services. With state revenue from property transfer taxes falling away, we can expect significant rises in state taxes and local government rates in the next couple of years. So even on a “what’s in it for me” criterion, the budget is a flop – unless “me” is some corporation able to make a profit from services abandoned by the government. More importantly it fails on basic economic grounds, for it does nothing to address fundamental structural weaknesses in the Australian economy. The Coalition would have us believe that it is the custodian of economic competence – an impression bolstered by partisan journalists in the Murdoch media and by other journalists who don’t know the difference between fiscal management (government bookkeeping) and economic management (attending to the strength and performance of the Australian economy). Our main structural weakness is manifest in widening disparities in incomes, wealth and opportunities. In themselves these disparities are serious, because they lead to social division, and they undermine any sense that there is some just and legitimate set of rules and norms governing our economic transactions. These disparities have arisen because we have a misshapen set of economic rewards, incentives and penalties. Those who speculate in property, who draw commissions from financial transactions, and who secure deals from political mates, all prosper, while those who grow food, teach children, care for the aged and contribute to the real economy fall behind. So-called “self-funded” retirees can draw tax-free incomes of $200 000, while younger Australians in the workforce pay full rates of tax and have the burden of paying off education debt – a debt accumulated because in the past governments have financed tax cuts by reducing spending on education. Then there is the ghastly mess our governments have made of policies relating to climate change. That failure is on two dimensions. One relates to our pitiful response to the need to reduce greenhouse gas emissions: we are falling behind in our obligations to the rest of the world, and are way behind in making the investments necessary to transform our energy sector. The other dimension is our failure to help our economy to adjust to the consequences of climate change – manifest in storms, lower rainfall, parched rivers and bushfires. The budget has provision for an “emergency response fund”, but where is the appropriation to help farmers re-locate from regions where grazing has become unsustainable? There seems to be no awareness of the urgency with which we must adjust our economic structure to reduce our emissions and to cope with already costly climate change. Similarly there seems to be no acknowledgement of the need to reduce our economy’s dependence on mineral and energy exports – a dependence that has brought us an unsteady growth path and the disruptions of widely-fluctuating exchange rates. The budget papers acknowledge likely falls in commodity prices, but only in terms of public revenue, not in terms of the problems facing the whole economy. It’s a document prepared by a politically compliant Treasury, concerned only with fiscal management rather than economic structure. The Coalition’s fundamental economic model is that “small government” allows the private sector to flourish. They accept that there may be some transient issues to do with inequality, but in the long run everyone will prosper. It hasn’t worked. Wages have stagnated while corporate profits have soared. If those profits were being re-invested the Coalition’s model may be working, but those profits have been handed back to investors in the forms of capital buy backs and high dividends. The economy is sloshing with money, but it’s in the wrong hands – more likely to be spent on frivolous consumption or asset speculation (housing in particular) by the already well-off rather than employment-creating investment. It’s a flawed model because it ignores the importance of a proper mix of private and public services in ensuring our prosperity. An obsession with “small government” has seen the Coalition impoverish the public sector with its fetish about holding taxes to 23.9 per cent of GDP. This ignores the reality that there are certain services that only the government can provide, and certain services that the private sector may be able to provide, but inequitably and at very high cost. Health care, education, security, and transport infrastructure are all areas where we need more, not less public expenditure. And of course we have the ongoing demand for social security transfers. 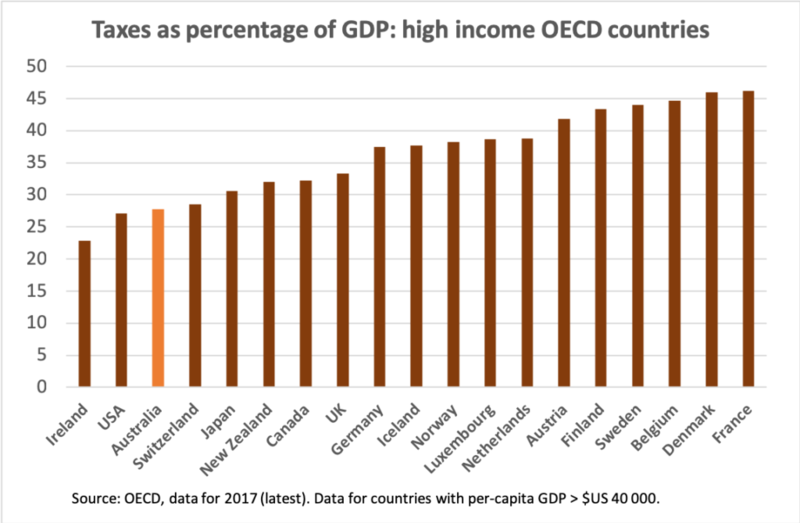 Among prosperous “developed” countries Australia is almost the lowest-taxed, at just under 30 per cent of GDP (including state and local taxes). Only the USA and Ireland have lower taxes. The USA has an unsustainable budget deficit (five per cent of GDP) and poor government services, while Ireland is taking advantage of its small size and EU membership to enjoy the temporary prosperity of a tax haven. We need to raise taxes to fund the services we need and to invest in the infrastructure, environmental protection and education assets we need to fund our future prosperity. The Coalition’s budget is confirmation that it is ignoring that need. Perhaps, living in its echo-chamber of like-minded believers in “small government” it really believes in its own economic competence, or perhaps it is deliberately sacrificing our future prosperity in the hope of being re-elected next month. Either way, the Coalition should not be trusted with another term in government. Ian McAuley is a retired lecturer in public sector finance at the University of Canberra, and is co-author, with Miriam Lyons, of Governomics: Can we afford small government?in which the case for an appropriate balance between public and private expenditure is explained. Very pertinent article. It certainly puts the skids under any pretence of worth, except it could have been worse. Although neoliberalism is starting to smell it’s not rotten enough for western governments to abandon it or even modify it. The obsession with small government means starving government agencies of proper funding so making privatisation more attractive as the government agencies falter in their ability to deliver. Trouble with this is the loss of skills in the government will take a generation after reversal to recover. Neoliberal policies alluded to here such as cuts to welfare, schools, and services in general are what is known as “Social Murder” or just plain Evil. The costs of such misgovernment will be worn by all of us as civil strife starts up, and it will! Unfortunately voting labour will not remedy the situation. They are just as culpable as the LNP. Time to sheet the blame for the fiscal wreckage back to the Howard Costello raising the top marginal threshold from $60,000 to $180,000, Capital Gains Tax concessions, Negative Gearing on property and Dividend Imputation. Wise Australian voters ejected the fiscal vanduls from Government in 2007, but in 2018 we are still bleeding profusely from the irresponsible cuts. NBN 2.0 the network upgrade on the cheap. That is delivering a service, especially for those on FTTN, that is barely satisfactory for current needs. If it were written down to market value, would we have a surplus? Speaking of the NBN, there’s an excellent long form article on Murdoch in the NYT which in passing mentions his disapproval of the NBN as a ‘government subsidized network’ in competition with Foxtel. It’s a depressing story.